For the last few weeks, there have been a lot of people on Twitter and Facebook posting updates about how many weeks/days/hours it is until Christmas. There has also been vast amounts of column space dedicated to analysis of the Christmas adverts from some of the main British retailers. I have been doing the adult equivalent of sticking my fingers in my ears and singing ‘lalalala’. It’s only November. We’ve just moved house. I can’t think about Christmas yet. But when my veg box arrived this morning, there was a wee surprise nestled in among the cavolo nero, sharon fruit, parsnips and tatties. 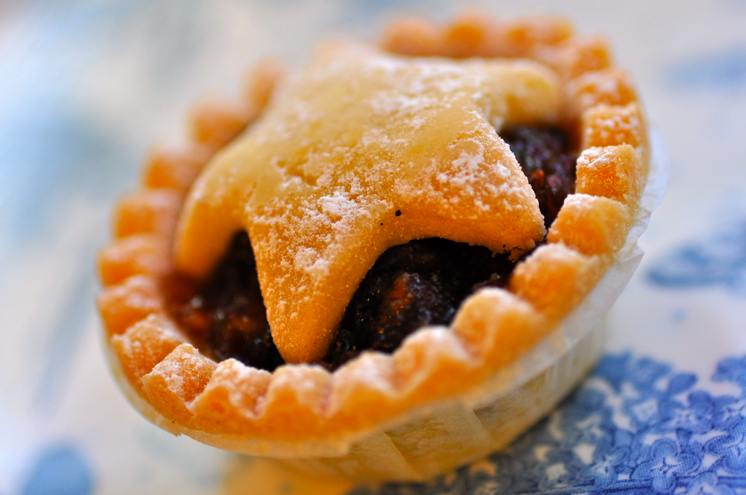 A mini mince pie. A yummy, pretty, bite-sized mince pie. I guess I can’t avoid it any longer. Christmas is coming. To help get in the festive spirit, check out the Christmassy posts from other bloggers over at Festive Friday on Thinly Spread. Ohh, that looks tasty! I’m still in denial though, its not December yet so its all lies! Oh thank you – I can’t take credit for making it though! I’m a vegetarian, but this dish looks so beautiful to me!! Lovely post. When you have the time, do drop by my space. Would love to hear from you! I’ve been focusing on Christmas for a few weeks now but I can’t/won’t eat my first mince pie until December….It would just feel wrong! I read on Facebook the other day that some of my friends are already starting to put up Christmas decorations. I could never put my decorations up before December, although I would never judge them for doing so. I get as excited, if not more so, than the kids when it comes to Christmas but I learnt a long time ago that the best things come to those who wait and I know that Christmas will be more special if I don’t try to hurry it along! I soooo want a mince pie right now!